College and university students submitted designs to reduce stormwater on their campuses, such as this design from Illinois Institute of Technology, Chicago, for the U.S. Environmental Protection Agency (EPA) Campus RainWorks Challenge. Photo courtesy of EPA. The U.S. Environmental Protection Agency (EPA) challenged college and university students to increase the use of green infrastructure on their campuses to reduce stormwater pollution. As a result, 218 teams of undergraduate and graduate students working with faculty advisors responded to the inaugural Campus RainWorks Challenge. The following winning teams were selected based on their analysis and planning; preservation or restoration of natural features; integrated water management; soil and vegetation management; value to the campus; and likelihood of implementation. University of Florida, Gainesville’s redevelopment plan won first prize for a large institution. Photo courtesy of EPA. University of Florida, Gainesville, won first prize for a large institution. 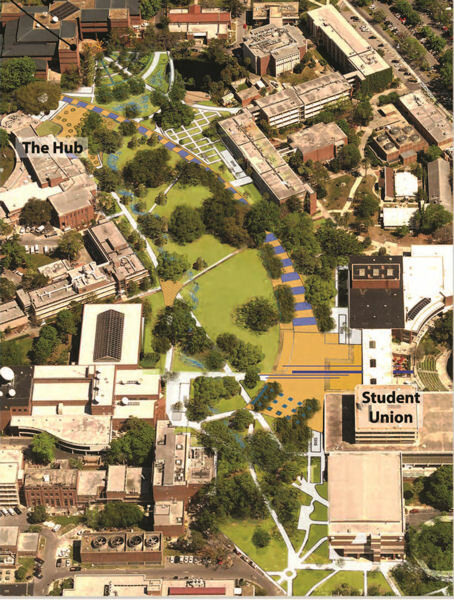 The team submitted a redevelopment plan for Reitz Lawn, a 4.5-ha (11-ac) open area and pedestrian corridor. The goal was to create a functional, attractive space that both raises awareness on campus and improves the quality of stormwater that reaches Lake Alice and drains into the local aquifer. 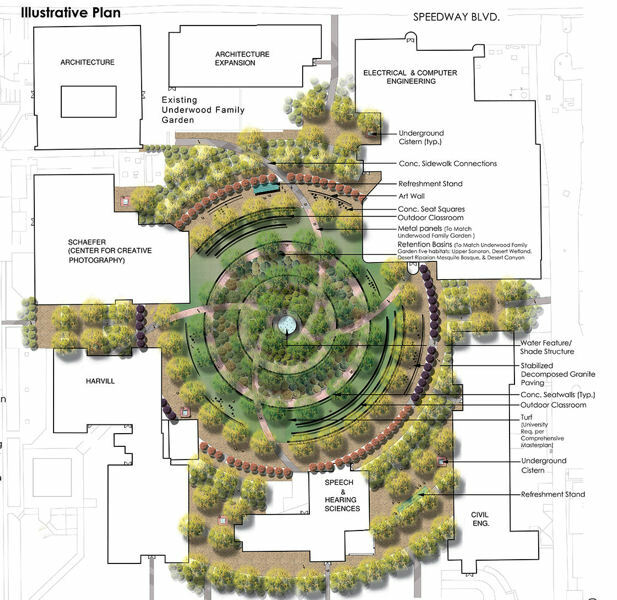 The students’ design incorporates stormwater ponds, rain gardens, a green wall, a green roof, a campus garden, and bioswales. According to the students’ models, the bioswales can manage a 100-year storm without flooding. Illinois Institute of Technology's redevelopment plan for a section of Dearborn Street won first prize for a small institution. elements. 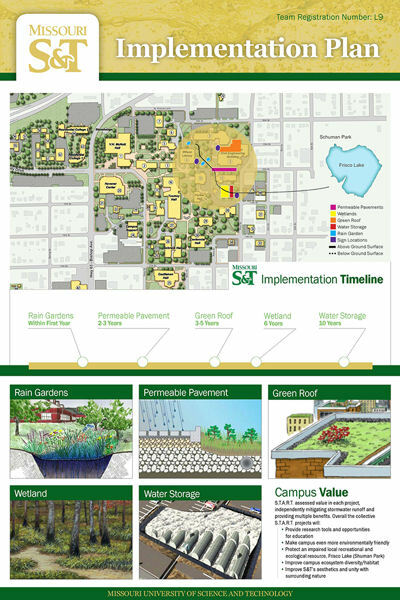 The goal was to reduce the effect of the campus on Chicago’s combined sewer system by using rain gardens, permeable walkways, and retrofits to academic buildings to direct stormwater into a treatment area. The design also would decrease reliance on potable water from Lake Michigan by using underground cisterns to capture about 11,355 m3 (3 million gal) annually of stormwater for landscaping. Together, the green infrastructure elements would reduce stormwater from the site by 70% to 80%. University of Arizona, Tucson’s redevelopment design for a parking lot won second prize for a large institution. Photo courtesy of EPA. University of Arizona, Tucson, won second prize for a large institution. The team submitted a redevelopment design for a 6500-m2 (70,000-ft2) parking lot that would be replaced with a campus common area featuring two rings of retention basins to infiltrate stormwater runoff; five underground cisterns to harvest runoff and heating, ventilation, and air-conditioning condensate from the adjacent buildings; and a translucent shade structure with an ephemeral water feature. Water collected in the underground cisterns would irrigate the landscape, reducing potable-water use from 2650 m3 to 340 m3 (700,000 gal to 90,000 gal) per year. The cisterns would be fitted with windows to show the water level, and, when full, the water would bubble out of the cisterns into a water feature beneath a central shade structure. Missouri University of Science and Technology, Rolla’s design won second prize for a small institution. Photo courtesy of EPA. Missouri University of Science and Technology, Rolla, won second prize for a small institution. The team submitted a design for three projects, including a green roof, rain garden, and permeable pavement. The projects, which take advantage of existing plans for university projects, seek to reduce nutrient and sediment pollution in Frisco Lake using technologies that are cost-effective for installation, as well as operation and maintenance. First-prize winners receive a $2500 cash award and $11,000 for faculty research on green infrastructure. Second-prize winners receive a $1500 cash award and $8000 for faculty research. Teams from Kansas State University (Manhattan), Columbia University (New York), California State Polytechnic University at Pomona, and the University of Texas–Arlington received honorable mentions for their entries. Read more about the winning and honorable mention projects.